Alias : DASHING DERRICK 700, TOOHI 159. I started writing in late 1972 in Brooklyn. At the time there were a lot of guys putting up there names on the streets and buses so I just caught on to that. I started writing Dashing Derek 700 but found that name to be too long to write and cut it short to Dash. I started hitting the trains once I met Lama. He took me to the Utica Avenue layup in Brooklyn, where we had to go through Lincoln Park climb up on to the train tracks, then run into the tunnel. In there they layed up the 2 trains and we just tagged up the outsides, then went into the insides with our markers. The biggest writers on the trains back then were such writers as Cliff 159, Stay High 149, Phase 2, Bug 170, Tracy 168, and a few others that I can't remember...it's been 30 years, but these were the guys I used to pay a lot of mind to. I liked the way Stay High 149 would hit up the insides with the Voice of the Ghetto which always made you stop and look at it. He had great style. Once I got to the trains I wanted to return again. Lama took me over to the Kingston Avenue layup and then to New Lots. We started going everywhere in Brooklyn and became almost like brothers. He took me to Atlantic Avenue to watch trains. Atlantic Avenue was our writers bench in Brooklyn. There Lama would introduce me to Falcon 789 who had great style back then. He used to hang out there often. He would later give me style when at the time I was bombing the trains with quick simple pieces. There I would also meet Diablo who I became very tight with and other Brooklyn subway killers like Tee 3YB and his brother Stim 3YB. We both took trips to the Bronx, at 149th Street writers bench where Lama would introduce me to Cliff 159 and Riff 170. The dude knew a lot of writers back then and you could say that's when I was really getting into subway bombing. My goal then was to be all city. Lama started losing his dedication and started going less and less. But being that I was meeting so many writers...for example...a guy would say to me that he was going to the 1 line and I would say I always wanted to hit that line and we would head there or I would take them to a few spots I knew. I lived right on top of the A yard which at the time held EEs, CCs, GGs, As, and Ds. In there I would meet ODD 1 who was king of that yard in 1974, plus others like Clet, Saint 150, Pro 2 and so many other dudes. So many writers at that time thought ODD1 lived in the A yard because his name was all over that yard and on every single train that was parked in there. this one writer in my shop class writing all over his desk. I went over and introduced myself. He turned out to be Danger 59. At the time, his name was all over my school as well as the train I took to school every morning. Through him I would meet some of his boys...Tero 3YB, AFX 2 and a few others. I introduced Lama to Danger and he took us to one of his spots, Coney Island Yard in Brooklyn. That had to be one of the biggest train yards in New York City. That place was paradise to any Brooklyn writer to hit. It held so many different subway lines. 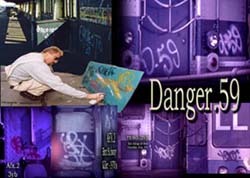 Danger knew a lot of people in the area which was a good thing, because it happened to be an all white neighborhood. So he looked out, and made sure nothing happened to me while I was there. 5, Krome 100, OZ 109, Chino 13, ODD 1, Clet, Pro 2, He 3, Duke 9, Tear 2, True 2, Cliff 159, Jel 161, Dean BYB (a/k/a LE, a/k/a KO), Mickey 729 (a/k/a TO 729), Hurst, (a/k/a 0I), Spear ( a/k/a DS 3 ) Crazy Dike (a/k/a CD), Movin 2 (a/k/a TI 149), RJ 2, IC 2, and Slave TF5. Not only did we all go hitting together, we were also good friends outside of writing graffiti. Fuzz 1 is one writer who really comes to mind because he did nice work and was only a little kid at the time. I remember meeting Fuzz on a train station in the Bronx. It was on the 4 line. 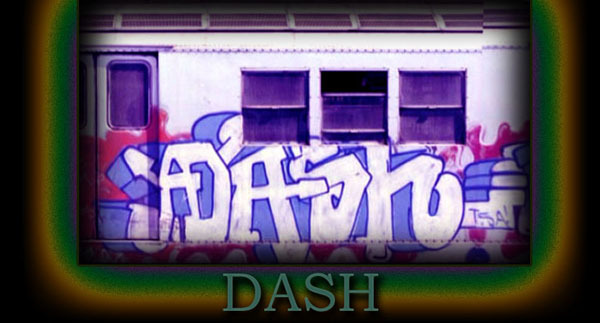 I was hitting up my name on a movie poster when I heard a voice...."so you're Dash." I looked down and saw this small white dude. He said he was Fuzz 1 and that he was bombing the 4 line. He was a real talented kid with a good way about himself. He took me to some of the lay-ups in the Bronx around Mosholu Parkway and I took him to some of the lay-ups in Brooklyn. Before I met Fuzz most of my pieces were just quick pieces almost like throw ups, except those I did earlier with Falcon 789. Fuzz got me into some of the colorful stuff. We would do pieces together and he at times would give me a few outlines and I would practice and pick up on it real quick. Falcon 789 was a writer from the tagging era who was very good with art. I met him through Lama at Atlantic Avenue's writers bench in Brooklyn. I started painting with him a lot at the Kingston Avenue layups. He would give me outlines and we would do nice stufftogether. I have a photo of a "Pot, Dust and Dash" car. This was supposed to be a whole car but we got chased out of the lay-up that night. In the 70s there were so many nice pieces running on the IRTs at the time, so I tried to keep up with what was going on around me. A writer I remember who was in a class by himself was Riff 170. The guy did some incredible art at the time. NO ONE could compete with the trains he did. He wrote under so many names and did whole cars under each of them. I remember dudes sitting at the subway station just waiting until one of his whole cars would go by. The man should have his work hanging in the museum of Graffiti art or Guggenheim museum . The 1 line was one of my favorite lines to hit. I started hitting that line really hard one year once I met Dean and the BYB boys. I would go with them to the 1 Yard that was an elevated yard in an all white neighborhood and bombed it all night. At times we would take off to the underground 1 tunnel that was always very sweet to hit. Never had any problems with getting into those places or chased out any of those spots but can recall getting raided at the pull ins and pull outs in Brooklyn. I was hitting this place where the train would pull into the last stop of the station, park and wait for the next trip out. The place was an outdoor train station and on the other side there were trees and a hill where we would run up, hit the lay-up with quick pieces on each subway car then run back down the hill and wait for the next train to roll into the station. It was like clockwork for us. One night I was with this writer from Brooklyn who wrote He 3. At the time he was all over the Ms, Js, and LLs. This one night he was with some of his boys, and they were making a lot of noise. We were all moving down to each car very quickly, when I looked out the corner of my eye and saw a few cops jump through the cars and grab He 3 and the writers he was with. The cops lined them up against the train car and started moving toward my way. I jumped in between the train cars onto the station, ran toward the exit of the station only to see two cops waiting for me there. I made a quick turn, jumped between the train cars once again down onto the hill, leaving those cops in my dust. I think that dude He 3 must have quit writing after that day because I never saw or heard from him again. That raid was pretty shaky. I did a lot of pieces on the trains, but never went out looking for them with a camera. This is something I really regret. A photo I would like to find is a whole car I did at Zerega Avenue in the Bronx which had to be the best work I had ever done. I even amazed myself. I remember the whole train station was full of paint fumes. I just went crazy on the train, not caring if anyone spotted me doing it. When I finished it the sun was coming up then I took off. I remember it ran on the 6 line and a few writers saw it running, but I never got to see it which was a real shame. By 1978 I started slowing down and went bombing a lot less than I used to. By the beginning of 1979 I stopped writing all together. I would still tag my name around here and there, but 1979 would be my last year of train bombing. I met my wife and had a family. I got a job with the City and started a little cable installation business for myself and never looked back until I got a call for a cable installation at a home somewhere in Long Island, which turned out to be the house of LIL SOUL 159. WOW...it's funny how life comes full circle. I would like to give a shout out to all of my old partners, Lama, Diablo. Rise, Dean, Falcon 789, ODD 1, Shot 5, Hurst, Ice 13, IC 2, RJ 2, and Pro 2. Sorry if I left anyone out, but it's been over 30 years. 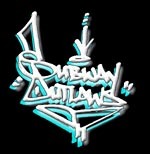 Should any one have any of DASH's work, please contact us at MESSAGE@SUBWAYOUTLAWS.COM. Interview conducted by LIL SOUL. 159 .Photo credits go to : Blade 1, Tracy 168 and Subway photo collector Danny Shult.